Certain days in your life always remain engraved in your hearts. A watch created for the 20th anniversary of Jeanne. She was born on May 15 at 3:25. The day of birth is represented by gemstones. The month is set with a stone at 5 o’clock since May is the fifth month of the year. The time of birth is shown by a stone set at 3:25. This is “Micheline”, a DELANCE watch, created specifically for an incredible Micheline. Filled with the lasting memories of her life, the mirror of her soul, the Micheline is her TalisWOman. She has kept all her grace and talents; her beauty has matured and is continually enhanced by the love she gives. Now she knows that life is not about waiting for the storm to pass… It’s about learning to dance in the rain. With 32 diamonds emphasizing the sign of infinity, this DELANCE says: “I will love you forever” as it tenderly evokes infinite love every second of every day. 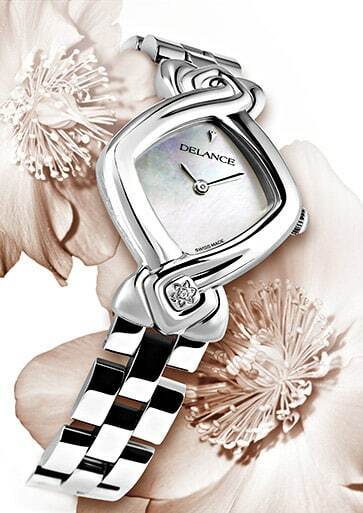 Her DELANCE “Sweet Sixteen” watch with 16 diamonds will accompany, encourage and support her each time she looks at it. It becomes her own private, silent mentor, a TalisWOman, helping her to accomplish her destiny.